Leaf Chain, Lotus and Grape, and Waterlily plates displayed here are factory-made! LEAF CHAIN 9 in. Plate in Amethyst....not many around in this color!. LEAF CHAIN 9 in. Plate in Blue. LEAF CHAIN 9 in. 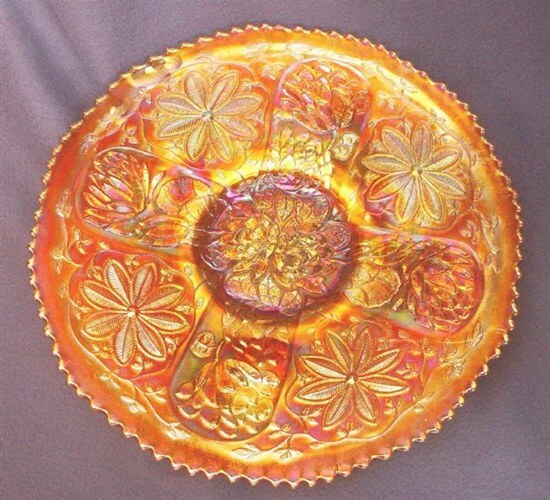 Plate in marigold. 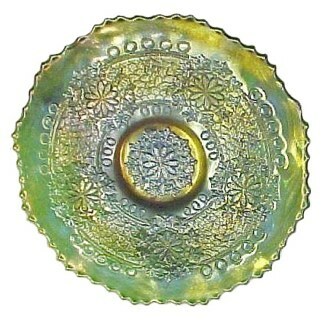 LEAF CHAIN Plate-Green, 9 in. diameter. LEAF CHAIN Plate - Blue 7.5 in. diameter. Carries the HORSE CHESTNUT Exterior. LEAF CHAIN: Cherry Chain and Leaf Chain are basically the same pattern. Absence of the cherries leaves us with Leaf Chain. A 6 ½”-7” bowl becomes a 7 ½” plate and the 8” or so bowl becomes a 9” plate. 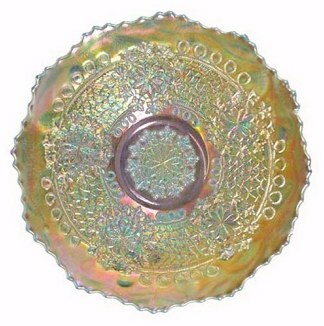 An aqua opal plate is the rarest example in the pattern. Although red bowls are not common, a little determination will be rewarding. They are quite desirable. Small plates and bowls have the Berry and Leaf Circle exterior; the large bowls and plates offer the Bearded Berry exterior. Small plates are found in blue, ice green, marigold and white. 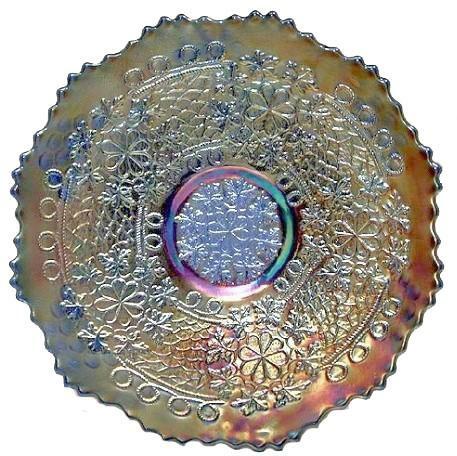 9” plates are known in amethyst, blue, pastel marigold, green, emerald green, marigold, teal and white. LOTUS & GRAPE 9 in. Plate in Amethyst. 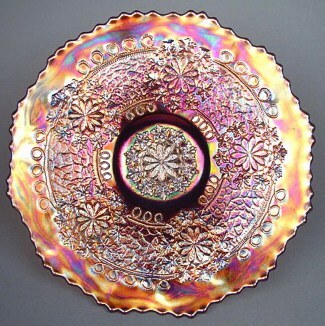 LOTUS and GRAPE: A super plate example in amethyst has sold for $8500., with others priced from $1600 to $3475. 9” plates in green, blue, and marigold are priced accordingly. When the grapes lack iridescence, resulting price is less. Please click here to view a blue plate in this pattern. 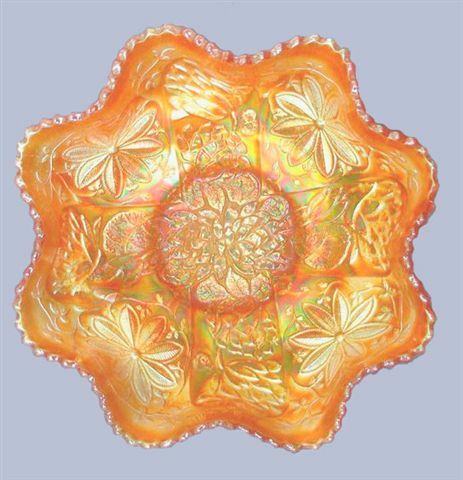 WATERLILY Chop Plate - Marigold. Almost 11 in. diameter. 9.5 in. 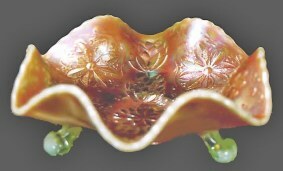 Master WATERLILY Ruffled, Footed Bowl. WATERLILY - 8.75 in. diameter. WATERLILY: Also variously called Lotus and Poinsettia. 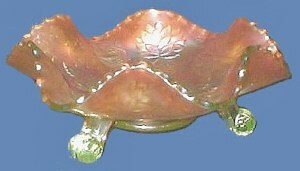 The 9”-10” footed bowls are a scarce shape found in colors of amethyst, blue, green, marigold, a couple of red ones, teal and vaseline. 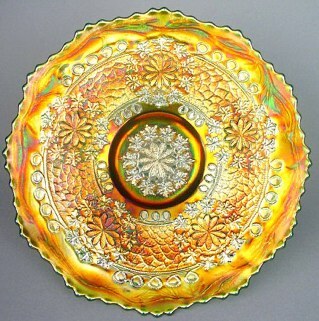 The first (nearly 11”) marigold chop plate was displayed by the late Bob Gallo while presenting a seminar in March 1997 for the San Diego - Southern CA convention in Ontario, CA. This one was later purchased by an Ohio couple when the Gallo collection sold in March of 1999. In May of 1997, we received a phone call from Nova Scotia, describing another of these plates. These are the plates dreams are made of my friends! Another of these beauties resides in North Carolina and yet another in Michigan! The one you see pictured here is the latest to surface. It recently came from the home of a 94 year old Marietta, OH lady. 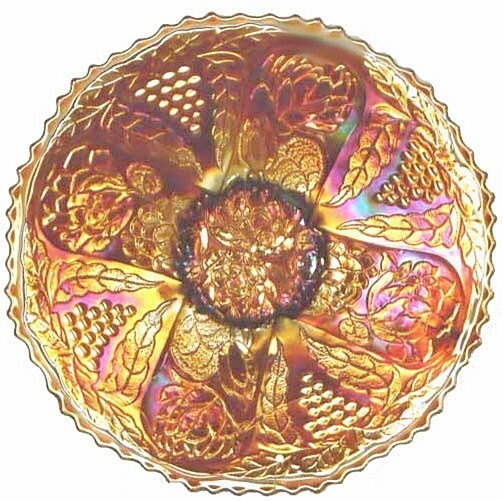 The only other carnival glass included in that estate sale were a couple of Fenton bowls, not in the least, veiled in excitement as this chop plate exudes! With only 5 or 6 of these having surfaced in a period of more than 10 years, we are left to wonder at the small factory order which must have been placed for this flattened version of the 9”-10” bowl. $3750., $2725., $3000. and $3500. are recorded prices for four of these marigold “marvels”! WATERLILY - 6 in. 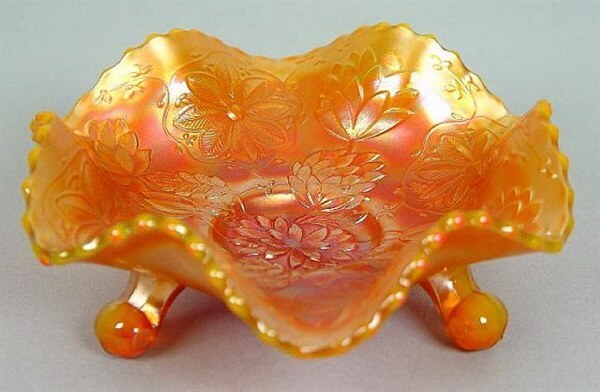 Bowl in Reverse Amberina Opal. 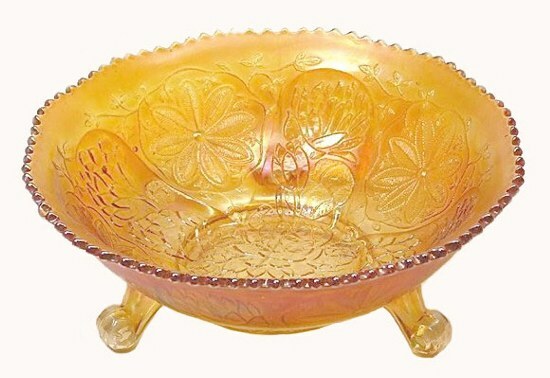 Small bowls or sauces, footed, are found in amber, amber slag, aqua, blue green, lime green opal, marigold, red, reverse amberina, reverse amberina opal and vaseline. Water Lily has no exterior pattern; only a smooth outer surface.